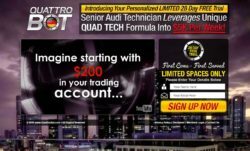 In this review of Quattro Bot we prove that this program is a scam made to lose your money. It is presented by Hans Kline. Kline claims that he used to work for Audi and then he learned to trade binary options. He developed the Quad Tech Formula that is used by the Quattro Bot. This robot can allegedly make you $5,000 per week. The reality is that Quattro Bot is a scam. Hans Kline is a fictitious person created by scammers. They just need you to believe that they can make you money, but in reality they will lose your money. We tested the Quattro Bot and we immediately saw that it is a scam. It is because of the software, this app is used exclusively by scammers. We have seen dozens of binary options scams using this same software. Take a look at the picture and you will see a few examples of other scams based on the same app, like Swiss Binary Robot, Knievel Money and Binary Godfather. We get a lot of feedback from real users of this software, so we know that in real trading it is losing money! Scammers that are behind Quattro Bot are getting paid by a certain broker for referring new depositing clients. In order to earn their affiliate commission, they need you to deposit money with their broker. This is the only purpose of Quattro Bot, make you deposit money with a certain company, so that scammers earn their commission. If you do it, the software will then trade with your money and lose it. That’s it. 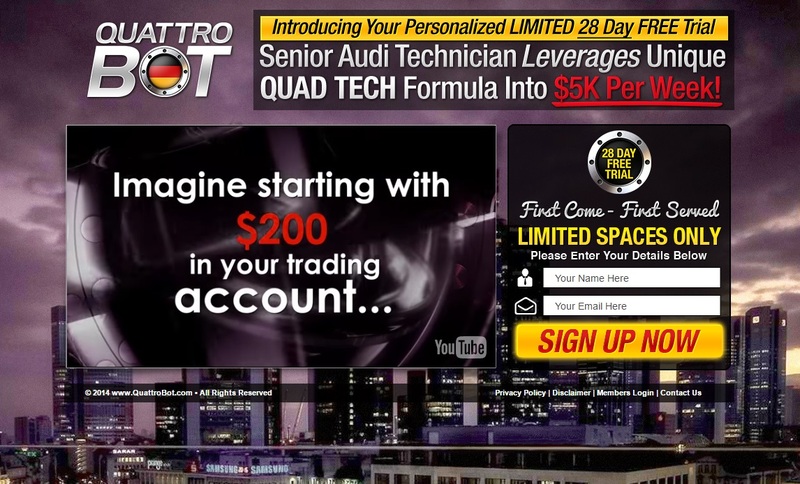 Quattro Bot is a simple scam that will push you to deposit money and then it will lose your money. Don’t do it! To make money with binary options you first need to learn how to trade. You can do that on a free demo account with a regulated broker. Keep learning on the demo until you can trade with consistent profits. Only the you can start trading with real money for real profits.